Lindsay M Starr is a beadwork and mixed media artist currently based in Nashville, TN. She spent her early childhood in Alaska, and her school age and college years in Oregon. Lindsay has a great appreciation for history, science, and nature and is consistently inspired by insects, sea life, color, and the significance of beads and beadwork throughout human history. She spends her days beading, walking at the zoo, and practicing yoga. Lindsay loves to share her knowledge and passion for beads and beadwork to hobbyists of all skill levels. I'm not quite sure how another month has flown by, another year, but it is time again for another Art Jewelry Elements component challenge. In December we decided to do another theme challenge: Sun. It might seem strange to do a sun themed challenge in the middle of winter, but it also makes a certain kind of sense. Winter is the time of year we most crave sunlight, crave the warm, sun-driven weather of the spring and summer, crave longer days and shorter nights. During December we experience the shortest day of the year, winter solstice, when the sun is in the sky for the least amount of time during the entire year. So, it does make sense to be inspired by the sun at this time of year, right? My problem is that I could not find inspiration for a typically "sun" themed piece. Perhaps it's that I really love winter? I grew up in Alaska, and the winter was definitely my favorite season at an early age. 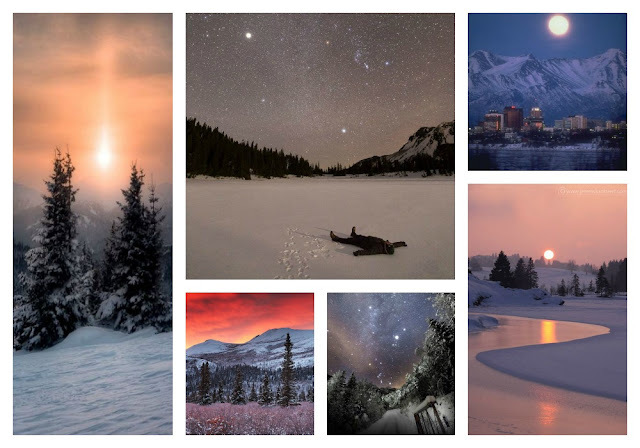 I have fantastic memories of bundling up to go outside and play in our twilight days, flopping on my back in the snow and gazing at all of the celestial bodies in the sky in the middle of the day, the constant presence of the moon and stars in the sky, no matter the time of day. I guess because of this when I think of a "winter sun" I don't envision our bright, yellow, celestial source of life. I think of stars...and because each star in our night sky (or winter day sky), is a faraway sun for another world, I ran with this inspiration for the challenge. 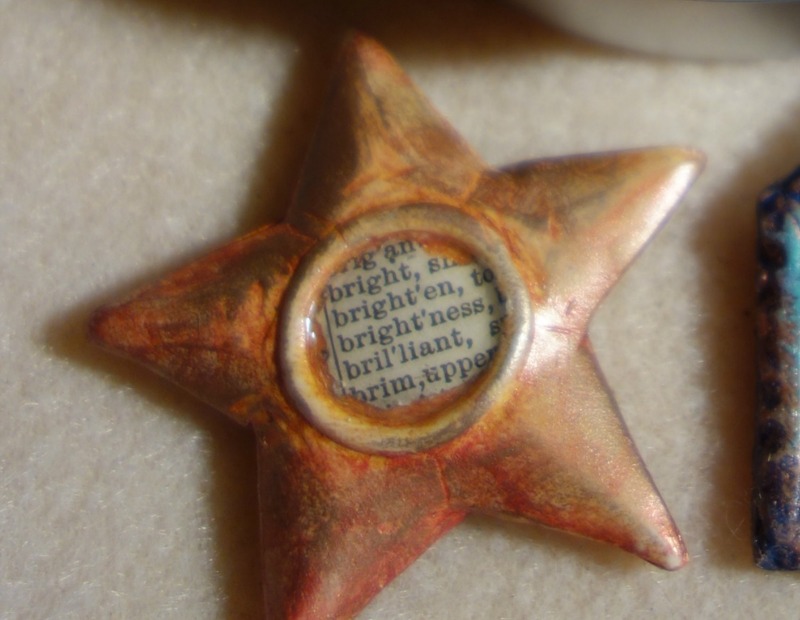 Luckily, Jenny had recently sent me this polymer clay star focal. It seemed to capture the feeling I was going for: the twinkling, shimmering, subtlety of starlight on snow. I started with the sling that holds the star in place in front and back. As soon as the star was captured in beads, I was able to work off of it with some loops and 2-hole stubby spike beads in this lovely purple halo color. The frame is worked off of the very end of these loops, to suspend the star in the center of the frame. I used the rest of the stubby spike beads in a double strand neck strap...it was quite the challenge to convince my beading wire to fit all around the outside of the frame, but somehow it got through all the holes. A simple copper slide clasp finished off the neckstrap, and an extra large Czech glass drop adds some needed weight to the bottom of the focal - just to keep it balanced while wearing. I hope you all enjoy my winter "Sun" challenge results! Please hop along and check out how everyone else was inspired! I'm off to do that now! I love this unique design Lindsay! You did a beautiful job capturing the star! Gorgeous beadwork! I love your interpretation... Alaska sounds like a wonderful place to grow up! Your beading always amazes me. So intricate and well done! I love your necklace with Jenny's focal. Interesting take on the theme and beautiful work as always Lindsay - thanks for taking part in the challenge. WOW - I knew it would be awesome and it is!!!! Love this! It looks fantastic and I adore the star Jenny sent you. It's perfect! Very very clever, and I love the colour scheme. And quite a different interpretation of the theme too. Love how your bead wrapped the star pendant! I also love the colors you used in your piece! Fantastic! I am always amazed at how you create such intricate pieces that still feel so organic. Very cool. Where to begin Lindsay? I fell in love with your description of growing up in Alaska, you make it sound amazing and magical and I think that shows in your design, just WOW! I am amazed by your design! I love how you have captured the star and the fact that the back is just as stunning as the front, and the colour, and the amazing bead work, just WOW! Yes! Its even a bit dream catcher-y in my mind. So glad that sun went to a great home!